In a large bowl, with washed hands, combine sirloin, pork, onion, ginger, garlic, tandoori paste and cilantro. Add salt to taste. Form into golf ball-sized (1 1/2-inch) meatballs. Make Ahead Tips: Make mixture and refrigerate until ready to form into meatballs and cook. 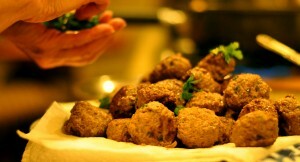 Or make ahead, bake meatballs undercooking slightly, refrigerate up to 24 hours and reheat before serving.